Integrate WHMCS with Xero to keep your billing system and clients in sync with your accounts. Our 5* rated, Xero recommended module sends Contacts, Invoices & Payments. Save countless hours of bookkeeping by automatically importing your WHMCS sales and transactions to Xero. Keep Xero in sync with all your WHMCS contact data. On first sync, contacts in Xero will be matched with those in WHMCS by their name (or company name). 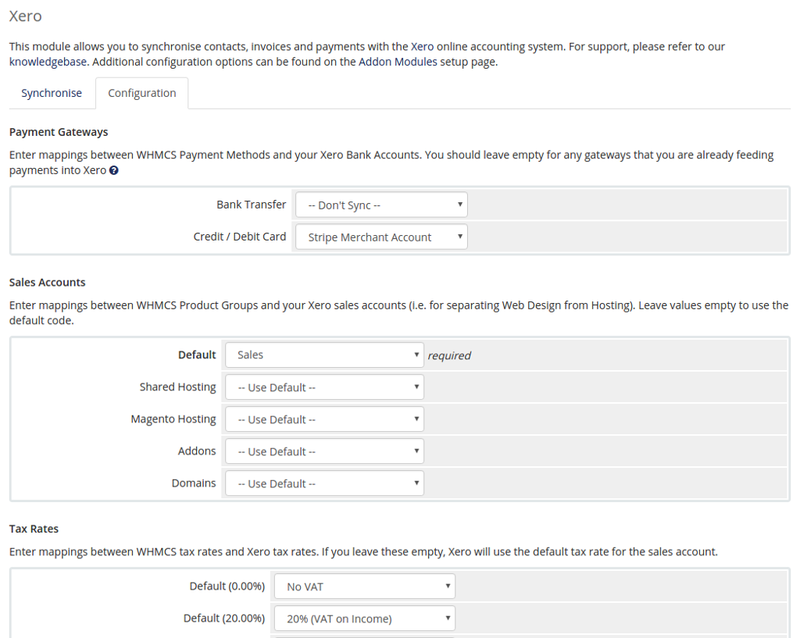 By default we use the customers WHMCS billing contact (if specified) for the name and primary address. With full support for single tax-rate invoices, VAT, VAT MOSS and GST. If you offer multiple currencies on WHMCS, we can sync these Invoices to Xero (as long as the base currency matches in both platforms). Full support for VAT MOSS tax rates to help you meet EU regulations. Choose a starting invoice number to sync from or sync everything from day one. 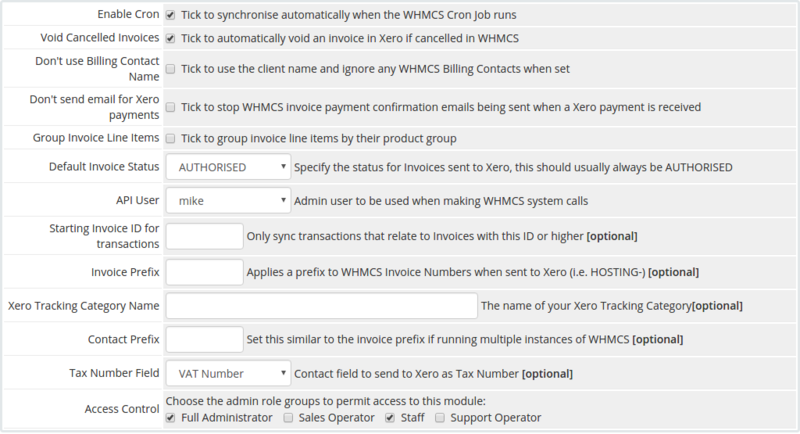 Enable this option to automatically void unpaid invoices in Xero when they are marked as cancelled in WHMCS. Save hours of manual reconciliation work by syncing your WHMCS payments to Xero and your Xero payments to WHMCS. We've written a handy guide to help you get started. Typical users can install the module and start their first sync in less than 10 minutes, with no complicated configuration required. We also offer a finely tuned selection of advanced configuration options to meet more specific needs. "We are using the complete integration. Absolutely brilliant compared to the alternatives. Rarely do you get software that works so well. We have used it now for only a little over a week, have pushed it hard and we are very pleased with our choice. Indeed, the capability of WHMCS for Xero was what clinched the decision to settle on subscribing to Xero. We have used WHMCS for some time and needed excellent integration with an accounting solution. Xero is very good; WHMCS for Xero clinched the decision." "I've been using it for a couple weeks now. Working very nicely. No issues at all"
"We've worked with Edge Hosting and their Add-on with great success, for a mutual client that required additional integration to WHMCS The solution is well thought out and implemented." If for any reason the integration doesn't work out for you, we'll give you a full refund within the first 30-days. No questions asked. Do you support PHP 7 / WHMCS 7? Yes! We support all versions of WHMCS from 6.3+ and PHP 5.6 / PHP 7.x. We don't offer trial licenses but you can give the module a go for 30-days with a money back guarantee at the end if for any reason it doesn't work out for you. Do you offer installation help and on-going support? All licenses come with FREE installation and upgrades for the life of your subscription. We also offer FREE installation on request. The installation instructions can be found along with additional documentation in our Knowledge Base.